Most entrance wounds, no matter the range, are surrounded by a reddish, reddish-brown zone of abraded skin — the abrasion ring (Figure 4.16). This is a rim of flattened, abraded epidermis, surrounding the entrance hole. Fresh entrance wounds have an abrasion ring with a moist, fleshy appearance. As the abrasion ring dries out, however, it assumes the more familiar appearance. 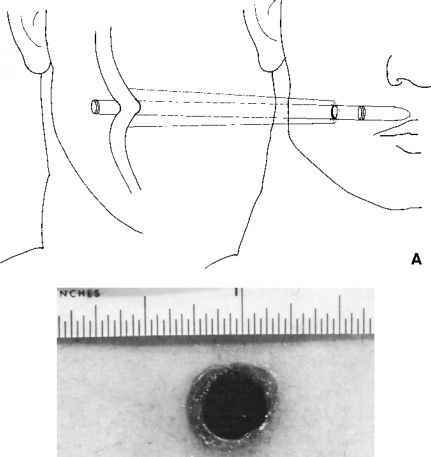 Figure 4.16 (A) The bullet indents the skin, punching a hole through it and abrading the margins of the entrance wound in the skin; (B) typical entrance wound with abrasion ring of margins. The abrasion ring occurs when the bullet abrades, ("rubs raw") the edges of the hole as it indents and pierces the skin (Figure 4.16). This ring is not due to the bullet's rotational movement as it goes through the skin, as even a very rapidly rotating bullet, e.g., a 62 gr. 5.56 X 45 mm, fired in the M-16A2, makes only one complete rotation in 7 in. (178 mm) of horizontal travel. The abrasion ring is also not due to the bullet burning the skin. While bullets may easily attain a surface temperature of over 100°C after leaving the muzzle, the contact time between the bullet and skin is extremely short, insufficient to cause a burn. Thus, while thermographic measurement of a copper jacketed 9-mm Parabellum bullet in flight showed a surface temperature of 147 to 152°C, contact time with the skin at a velocity of 1148 ft/s (350m/s) would be approximately 0.1 ms.5 That bullets do not burn the skin has been known for some time. In the late nineteenth century, Von Beck conducted experiments to determine the amount of heat imparted to both lead bullets of large caliber and jacketed .30-caliber rifle bullets.6 He found that the temperature of a recovered lead bullet of .45 caliber was 69°C; a steel-jacketed .30-caliber bullet 78°C and a copper-jacketed .30-caliber rifle bullet 110°C. The missiles were handled by the fingers and never possessed sufficient heat to burn skin. The abrasion ring can vary in width, depending on the caliber of the weapon, the angle at which the bullet entered, and the anatomic site of entrance. Entrance wounds in the skin overlying the clavicle generally have a wider abrasion ring than those in other parts of the body, possibly due to reinforcement of a thin layer of skin by curved bone (Figure 4.17A). The abrasion ring around the entrance hole can be concentric or eccentric, depending on the angle between the bullet and the skin. 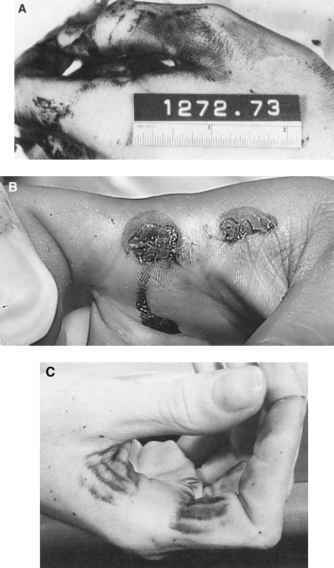 A bullet striking perpendicular to the skin should produce a concentric abrasion ring (see Figure 4.16). If the bullet penetrates at an oblique angle, the zone of abrasion in the skin will be eccentric, with the zone wider on the side from which the bullet comes (Figure 4.17B). This however, assumes that the skin is flat. People, however, are three-dimensional, with curves, depressions, and projections. 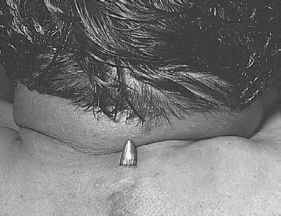 Thus, the bullet may be fired perpendicular to the body but strike a projecting surface, e.g., the breast so that an eccentric abrasion ring wound is produced even though the bullet is going straight into the body. Thus, it is never possible to say with certainty in which direction a bullet has traveled through the body from examination of the entrance wound alone. Abrasion rings may have very unusual configurations. In Figure 4.18A, the abrasion ring, besides being markedly eccentric, is divided into two sections. The medial end of each is "squared" off. The individual was shot in the center of her chest, between her breasts which were pushed together by her brassiere. The bullet abraded the inner surface of both breasts before penetrating the chest wall in the cleft between the breasts. The individual shown in Figure 4.18B was crouching when shot. Both bullets followed the same path through the body. Their abrasion rings, however, are markedly different because of the irregular dips and peaks in the skin caused by bending over. 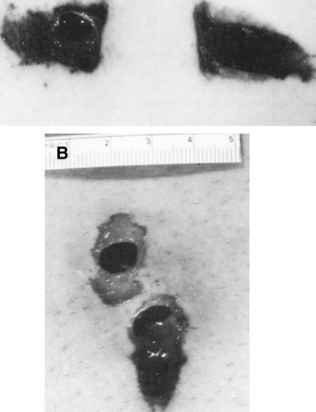 Figure 4.17 (A) Atypical entrance in skin overlying clavicle; (B) entrance wound with eccentric abrasion ring due to bullet striking skin at angle. Arrow indicates direction of bullet. abrasion rings (Figure 4.19A). In one unusual instance, an entrance from a .38 Smith & Wesson lead bullet (a very low-velocity round) also did not have an abrasion ring (Figure 4.19B). Entrance wounds of the palms and the soles as well as re-entry wounds of the axilla usually do not have abrasion rings. Distant or intermediate entrance wounds of the palms and soles differ from wounds of the skin in other areas of the body in that the entrance is stellate, with tears 1 to 3 mm in length radiating from the entrance perforation; or are "H" shaped or slit-like. These wounds typically have no abrasion ring (Figure 4.20 A-B). They resemble and are often mistaken for exit wounds or cuts. The same picture may be seen in entrance wounds of the elbow. The common factor tieing together these three locations is the increased thickness of the skin in these regions. Figure 4.18 (A) Two areas of abrasion (compound abrasion ring) due to single bullet entering middle of chest, between breasts pushed together by brassiere. (B) Two entrance wounds with markedly different abrasion rings, though trajectory of bullets through body was identical. 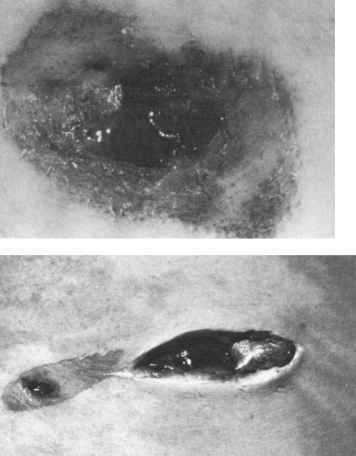 Figure 4.19 (A) Entrance of partial metal-jacketed .357 Magnum bullet showing absence of abrasion ring and presence of microtears; (B) entrance of .38 caliber S & W bullet showing absence of abrasion ring. wound shown in Figure 4.19A due to a .357 Magnum bullet, there is both absence of an abrasion ring and micro-tears. There is usually no difficulty determining that an entrance wound without an abrasion ring is truly an entrance. With the exception of the palm, sole, and elbow, these wounds are oval to circular with a punched-out clean appearance to the margins, totally unlike that of exit wounds. The exceptions to this are reentry wounds of the axilla and scrotum, which may be slit-shaped and resemble exits. Fortunately, these latter wounds are virtually all penetrating rather than perforating. 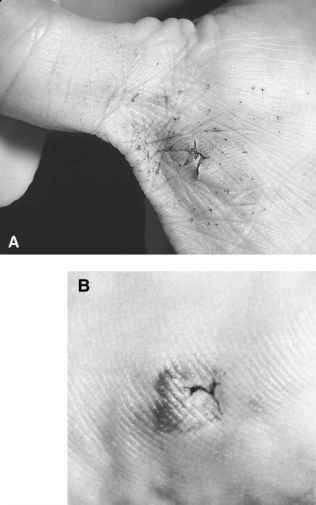 Figure 4.20 (A) Stellate entrance wound of palm without abrasion ring. Note embedded grains of powder but no true tattooing. (B) Entrance wound of sole of foot. the x-ray interpretation was correct; the entrance in the leg was posterior-medial and the exit was lateral. Distant gunshot wounds of the head may have a stellate or irregular appearance simulating a contact wound. This phenomena is seen with both handgun and rifle bullets. It is most common over bony prominence such as the orbital ridges. The author has seen this phenomena in other areas of the head as well, e.g., at the hairline; between the eyebrows; over the cheekbone; along the edge of the mandible; on the top and on the back of the head (Figure 4.22). These wounds may be incorrectly interpreted as contact wounds or exits. 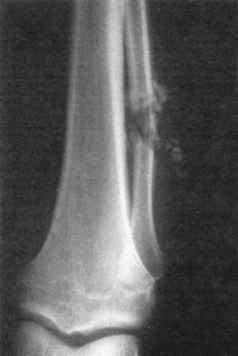 Figure 4.21 X-ray showing fracture of fibula, with bone fragments following lateral path. Microscopic sections through a gunshot wound of entrance show a progressive increase in alteration of the epithelium and dermis as one proceeds from the periphery of the abrasion ring to the margin of the perforation. The most peripheral margin of the abrasion ring shows a zone of compressed, deformed cells many of which show nuclear "streaming." As one proceeds centrally, there is loss of superficial cellular layers so that only the rete pegs remain adjacent to the perforation.7 Such epithelial changes occur in contact, near-contact, intermediate, and distant wounds. 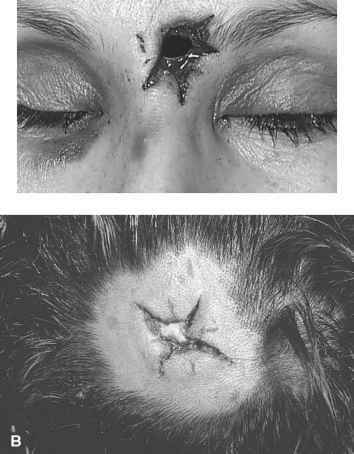 Figure 4.22 Distant range, stellate entrance wounds of: (A) forehead; (B) top of head. deposits of soot covering one-third to one-half the surface area of the copper jacketing. This was the source of the deposit of soot. In intermediate-range wounds, microscopic sections of the entrance should show grains of powder embedded in the skin adjacent to the entrance hole. Although true ball powder quite commonly embeds itself in the skin, flake powder generally bounces off. For the most part, the grains of powder are embedded in the epidermis. Ball powder, and on occasion flake powder, may however, perforate the epidermis, coming to rest in the upper dermis. Flake powder that does become embedded usually consists of small, thick disks and not the more common large thin disks (flakes). Identification of a wound as contact or intermediate is best made with either the naked eye or a dissecting microscope rather than the microscope. Positive identification of material recovered from a wound as powder can usually be made by the shape of the powder grains if they are intact. If they are partially burned and there is no definite shape, the material can be analyzed by thin-layer chromatography to identify the material positively as powder.8 A cruder test involves touching what appears to be a powder grain with a red-hot probe. This will cause the powder to burn. Exit wounds, whether they are the result of contact, intermediate, or distant firing, all have the same general characteristics. They are typically larger and more irregular than entrance wounds and, with rare exception, do not possess an abrasion ring. 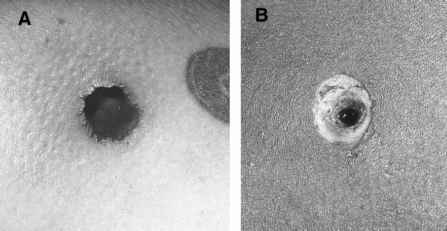 Exit wounds can be stellate, slit-like, crescent, circular, or completely irregular (Figure 4.23). Stellate exit wounds can be seen in the scalp and may be confused with contact wounds. Figure 4.23 (a-c) Exit wounds. wounds produced were smaller than the entrances because the missiles had less energy at the time of exit compared to when they entered the body. Figure 4.24 (A) Shored exit. (B) Shored exit — incising the skin lateral to the shored exit reveals the bullet. belts, as well as from tight clothing. Fresh shored wounds have a moist succulent appearance. The pattern of the material overlying the shored exit may be imprinted on the edges of the wound. Shored wounds have very wide, irregular, abrasion collars and when dry may simulate contact wounds. Occasionally, a bullet traveling through the body will lose so much velocity that, while it may have sufficient velocity to create an exit hole, the bullet will not exit. This may be due to the elastic nature of the skin or resistance to its exiting by either an overlying garment or an object such as a seat back or wall. In the latter case, the "exit" may show shoring of its edges. Occasionally, a bullet may be found protruding from its exit (Figure 4.25). Figure 4.25 7.62 x 39 mm bullet projecting from exit. The size and the shape of the exit wound are dependent to a certain degree on the location of the exit. In lax skin, the exit wounds tend to be small and slit-shaped. In contrast, where the skin is stretched tightly across a bony surface, e.g., the scalp, exit wounds tend to be larger and more irregular, often with a stellate configuration. Although exit wounds are typically larger than entrance wounds, it is possible for an exit to be smaller than the entrance and in fact smaller in diameter than the bullet. The last phenomenon is due to the elastic nature of the skin. Another significant fact to be remembered concerning exit wounds is that the shape of an exit wound does not correlate with the type of bullet used, e.g., roundnose, hollow-point. If one examines the whole spectrum of incomplete, partial, and complete exit wounds, one sees a progression in their development. First is the bullet lodged subcutaneously without disruption of the overlying skin. Next is the incomplete exit, consisting of one or two small superficial slit-like lacerations in the skin with the bullet still in the underlying subcutaneous tissue. These lacerations do not communicate directly with the bullet or wound tract. 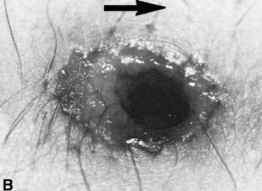 They are "tears" in the skin produced by eversion of the skin as the bullet attempts to exit. The elastic limit of the skin is exceeded, and the skin tears. The paired lacerations may represent the opposite ends of a bullet attempting to exit sideways. Next is the bullet that breaks the skin, but cannot exit and rebounds back into the wound because of the elasticity of the skin. The exit may or may not be shored. The missile had sufficient velocity to cause the exit but insufficient velocity to leave the body. Then comes the bullet that exits, hits a hard surface and is deflected back into the exit wound (see Figure 4.24B). Such exits are virtually always shored exits. Last is the complete exit. A common and seemingly logical assumption that is not usually true is that a bullet on exiting the body will continue in a straight path that is a continuation (projection) of the path the bullet followed in the body. As a bullet passes through the body, however, it becomes unstable and its yaw increases. If the path is sufficiently long, the bullet will tumble, ending up traveling base forward. Thus, an exiting bullet may be wildly yawing and/or traveling base forward. Such a bullet is no longer aerodynamically stable and can go off in any direction. The farther such a bullet moves from the exit, the more the bullet will veer from its projected trajectory. If in passing through the body the bullet undergoes deformation, this will also contribute to the tendency of the bullet to veer off its projected course. Knowledge of this phenomenon is important in trying to reconstruct the shooting scene. Thus, with bullets embedded in a wall, one can accurately and confidently determine their point of origin, i.e., where they were fired from, by projecting backward along their trajectory, only if these bullets have not passed through a body. A graze wound is one in which a bullet strikes the skin at a shallow angle, producing an elongated area of abrasion without actual perforation or tearing of the skin (Figure 4.26A). In a tangential wound, the injury extends down through to the subcutaneous tissue (Figure 4.26B). The skin is torn, or "lacerated," by the bullet. In both graze and tangential wounds, it may be difficult to tell the direction in which the bullet was traveling when it produced the wound. Examination of the two ends of a tangential wound will often but not always reveal the entrance end to have a partially abraded margin, i.e., a cap of abraded tissue, while the exit end will be split. Tears along the margin of a tangential wound point in the direction the bullet moved (Figure 4.26B). In both types of wounds, piling up of tissue may occur at the exit end. Superficial perforating wounds are shallow through-and-through wounds in which the entrance and exit are close together. They may be difficult to interpret. The entrance will usually have a complete but eccentric abrasion ring, whereas the exit will have abrasion of only a portion of the circumference. The abrasion at the exit points the way the bullet was moving; the eccentric abrasion of the entrance, the way the bullet was coming from. If the path of the bullet is immediately under the skin, the overlying skin may show traumatic stretch stria (Figure 4.26C). Re-entry wounds occur when a bullet has passed through one part of the body and then reentered another part. The portion of the body initially perforated serves as an intermediary target. Most commonly, this occurs when a bullet perforates an arm and enters the thorax. The reentry wound is usually characterized by a large irregular entrance hole whose edges are ragged and a wide, irregular abrasion ring (Figure 4.27). Reentry wounds of the axilla caused by missiles that have passed through the arm often have a very atypical appearance. Such wounds may be oval to slit-shaped with a very thin or even absent abrasion ring (Figure 4.28). They often so nearly resemble a wound of exit that they cannot be differentiated from an exit wound if considered alone. Shoring of an entrance wound may be seen with a re-entry wound of the chest from a bullet that perforated the arm. This occurs when the arm is against the chest at the time the bullet perforated the arm and entered the chest. The chest "shores up" the exit in the arm and the arm "shores up" the entrance in the chest (Figure 4.29). These shored entrance wounds are due to skin around the reentry site slapping back against the arm that was against the chest.